The United States of America is the child nation of the United Kingdom. With this being well known, American surnames come from all over the world. Chinese surnames are the most ancient in the world, they go back some 3,000 years. In Europe, the very concept of surnames was unknown before the 11th century. In Japan, Toyotomi Hideyoshi’s decree of 1587 forbided all non-samurai (90 percent of the population) from bearing either swords or, that other mark of distinction, surnames. By the 19th century, impoverished daimyo (feudal lords) were actually selling surnames to commoners. 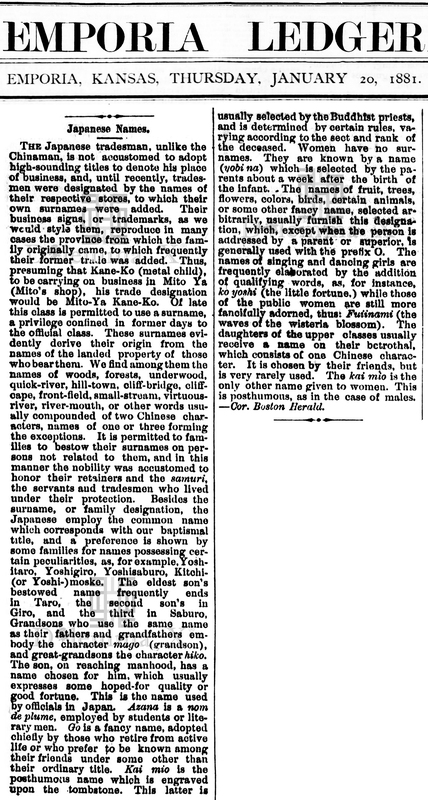 In 1875, the new Meiji regime required the lower orders to assume an officially acknowledged surname. The origin of surnames by native Africans differ by ethnic groups and customs. 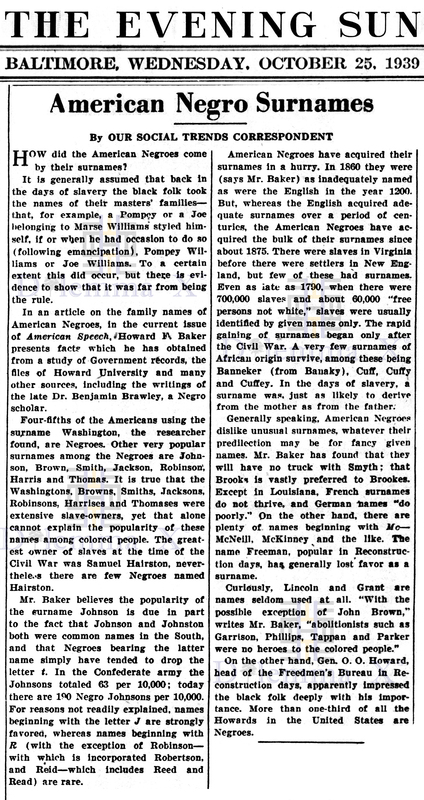 African Americans were not allowed to retain their African family given names, during enslavement and were forced to take on European names. 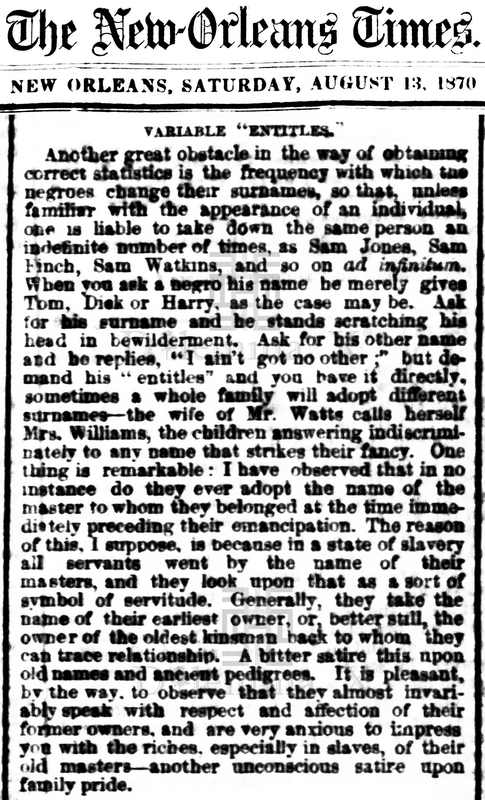 During enslavement most African Americans only had first names. 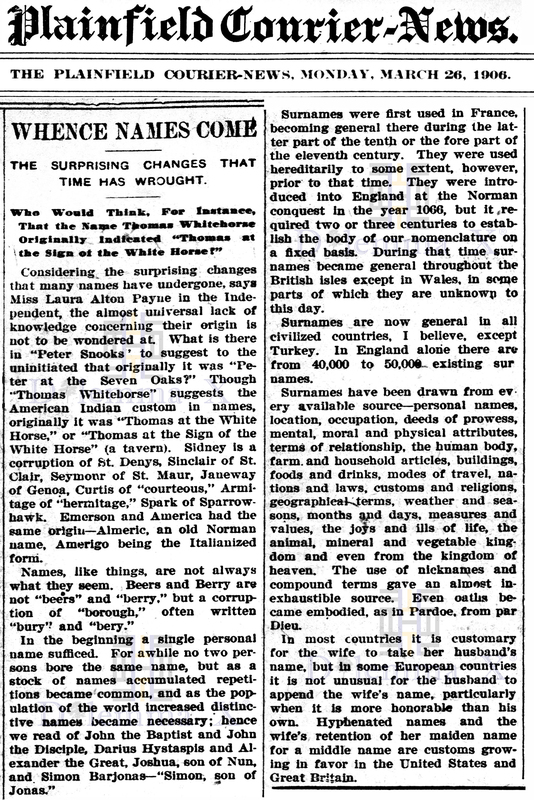 The British Americans: Before the Norman Conquest of Britain, people did not have hereditary surnames. The native British people were known just by a personal name or nickname. 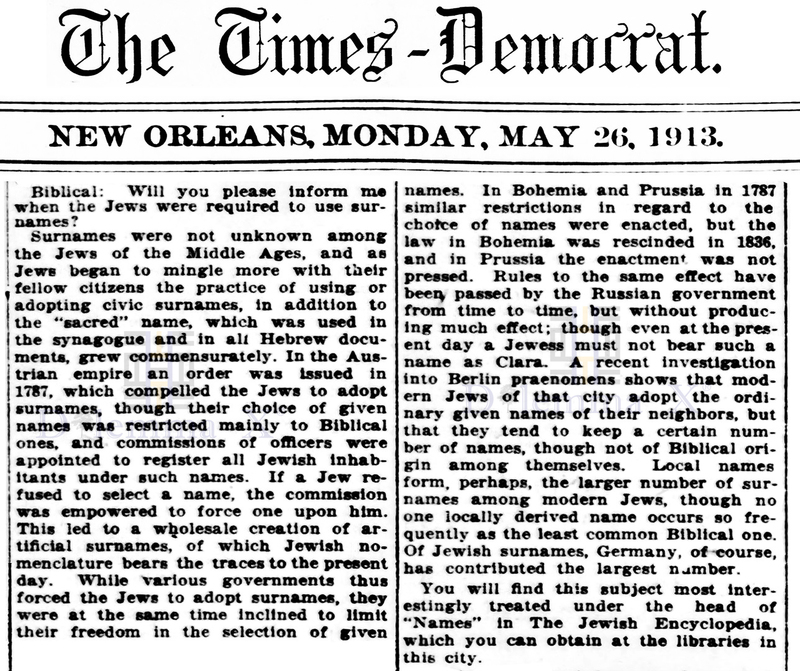 With that said below you will find a few historical newspapers that discuss the origins of surnames within the United States. Let’s begin with a review of British surnames and their origins. After 1066, the Norman barons introduced surnames into England, and the practice gradually spread. Initially, the identifying names were changed or dropped at will, but eventually they began to stick and to get passed on. So trades, nicknames, places of origin, and fathers’ names became fixed surnames – names such as Fletcher and Smith, Redhead and Swift, Green and Pickering, Wilkins and Johnson. By 1400 most English families, and those from Lowland Scotland, had adopted the use of hereditary surnames. Most Saxon and early Celtic personal names – names such Oslaf, Oslac, Oswald, Oswin and Osway (‘Os’ meaning God) – disappeared quite quickly after the Norman invasion. It was not fashionable, and possibly not sensible either, to bear them during those times, so they fell out of use and were not often passed on as surnames. However, some names from before the Norman Conquest survived long enough to be inherited directly as surnames, including the Anglo-Saxon Cobbald (famous-bold). New surnames continued to be formed long after 1400, and immigrants brought in new ones. 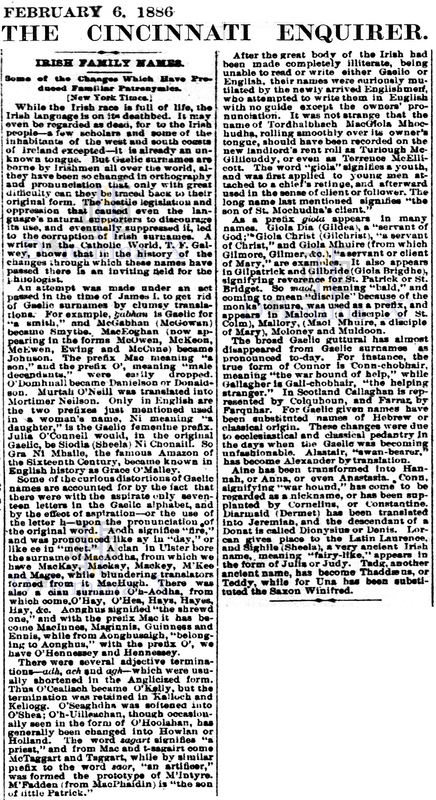 Many Irish and Highland Scottish names derive from Gaelic personal names, as do those of the Welsh, who only began to adopt the English system of surnames following the union of the two countries in 1536. This is all too far back to be helpful in researching family origins, although the study of a particular surname may be useful when the investigation points to an area where it appears often. Sometimes two different names can appear to be the same one, being similar in sound, but different in origin. The fairly common name of Collins is an example of this. It comes from an Irish clan name, but it is also one of several English surnames derived from the personal name Nicolas. Other surnames were formed from a person’s job or trade. The three most common English names are Smith, Wright and Taylor. Cook and Turner are also very common. A name ending in -man or -er can usually imply a trade, as in Chapman (shopkeeper), and obvious occupation names are Goldsmith, Nailor, Potman, Belringer, Hornblower, Fiddler, Brewer, Piper, Baker and so forth. Among the less obvious are Latimer (interpreter), Leech (physician), Barker (tanner), Jenner (engineer), Milner (miller rather than milliner), Lorimer (bridle and bit maker), Pargiter, Pargetter and Dauber (plasterer), Bannister (bath keeper), and Crowther and Crowder (stringed instrument player). The rarer occupational names are sometimes restricted in their distribution, as are other names that possibly originated with only one or two families. For example, the Arkwrights (makers of arks or chests) are from Lancashire, the Crappers (croppers) and Frobishers (furbishers or cleaners of armour) are from Yorkshire, and the Dymonds (dairymen) are from Devon. On the other hand, some distinctive names were influenced by more prolific occupational names, and names that started out as Goldsmith, Combsmith or Smithson may have become simply Smith. Sometimes a nickname became a hereditary surname. Names such as Fox, from the crafty animal, or White, perhaps from the hair or complexion, are widespread. However, the pronounced regional distribution of names such as Nice in Essex or Wildgoose in Derbyshire suggests single family origins. In some cases, nicknames are from Norman-French words, such as Papillon (dainty or inconsistent, from butterfly) or Foljambe (deformed leg). Names deriving from plants and animals are almost certainly nicknames – such as Catt, Sparrow and Oak – but may also be location names or even occupations. But most nicknames come from colour, complexion or form – names such as Armstrong and Strongitharm, Heavyside, Quickly, Slowman, Smallman, Fairfax and Blunt (fair-haired). Other examples of nicknames derive from personal or moral qualities, for example Good, Goodchild, Thoroughgood, Allgood, Toogood and Goodenough. Other examples are Joly, Jolibois and Joliffe, or Kennard (royal-brave). And some – such as Puttock (greedy) or Coe (jackdaw) – show contempt or ridicule. Many baptismal or Christian names have become surnames without any change. A son may have acquired his surname by adding -s or -son to his father’s name. The first method was favoured in the south of England and in the western border counties (where the practice was later copied by the Welsh), while the second was preferred in the northern half of England and lowland Scotland, and was a late development. Occasionally, -son was added to a mother’s names, as in Mallinson and Tillotson – both from Matilda. The son of William might therefore end up with the surname Williams or Williamson, but other possibilities include Will, Willett, Wills, Willis, Willimott, Wilkins, Wilkinson, Wilcox or Wilcockson. Other baptismal or personal names may have been extended to become a form of nickname, for example Littlejohn, Micklejohn (largest/eldest-John), Prettejohn (handsome John), Applejohn (orchard John) and Brownjohn. In Wales the ‘patronymic’ system of taking the father’s forename as the child’s surname, therefore a change at each generation, continued in some communities until the 17th century. Evan Griffith could be the son of Griffith Rhys, who was himself the son of Rhys Howell – this being written as Evan ap Griffith ap Rhys ap Howell. ‘Ap’ meaning ‘son of,’ just as with Up-, O’-, Fitz-, Witz- and Sky-. Over time, names such as Ap Rhys, Ap Howell and Ap Richard could become liaised to become Preece or Price, Powell and Pritchard. Please click on the article images below to enlarge for better viewing. Click your return arrow to return to this topic.